The biggest news in tennis these days seems to be Rafael Nadal's return to competition after over 7 months away due to injury. He was successful in his first appearance in doubles with partner Juan Monaco and now has also played his singles match. He started out nervously, getting broken immediately and barely winning any points in the first couple games. He eventually was able to break back after a long game on his opponent's serve, however, and that seemed to give him confidence. Though he wasn't playing anywhere near his best, by the second set there were some typical Nadal-on-clay type shots that should make him and his team feel encouraged for the future. 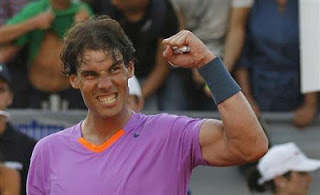 It will be interesting in the next few matches when he has at least a bit stiffer competition if the rust will still be evident or if he will start looking quickly like the old Rafa again. I know every tennis fan is very curious to see what 2013 will hold for Mr. Nadal. When Roger Federer isn't playing, even if there is other tennis going on, I can't help but start thinking ahead to his next tournament. Such is the case right now, waiting for three upcoming tournaments he will be playing over the next month. 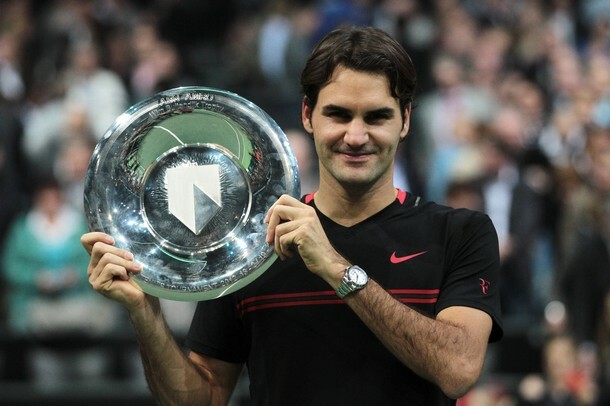 As I was thinking about his next three tournaments in Rotterdam, Dubai and Indian Wells, I realized that last year he won all three of these. Wow, that's impressive! While I doubt that he would be able to repeat this, it certainly would be great if he could win at least one of these. By doing so he would tie John McEnroe's title count at 77, which I was hoping would happen at the end of last year. I would love to see him make it to 80 this year, but I am trying to lessen my expectations of what he "should" achieve and just enjoy the moments of getting to see him play his beautiful tennis. That is hard to fully do, though, and I am hoping for a good result next week in Rotterdam - i.e., holding the trophy at the end.